If you are headed to Tulum, chances are you will land at Cancun airport. 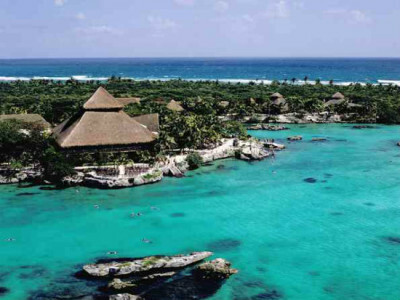 Tulum is about an hour and a half drive from Cancun Airport. 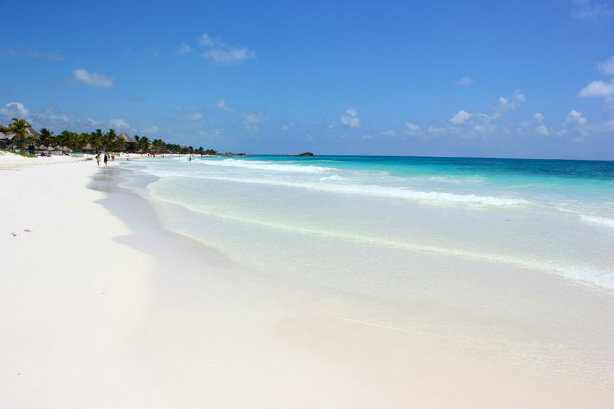 Although you can find a few all inclusive resorts, Tulum has retained it’s “off the beaten path” feel. You can choose to really get away from it all and stay in a cabana, camp, or stay in a small hotel. WHEN TO VISIT/WEATHER: The high season in the area occurs in the dry winter months from December through April. The peak seasons in Tulum are Christmas and Spring Break. The weather is a comfortable year-round average of 80 degrees F.
MONEY: Mexican money is the peso. It floats against the dollar and can be exchanged at banks and change booths. American dollars are accepted almost everywhere, except in remote areas, at a variable exchange rate. Credit cards are accepted only in bigger cities. 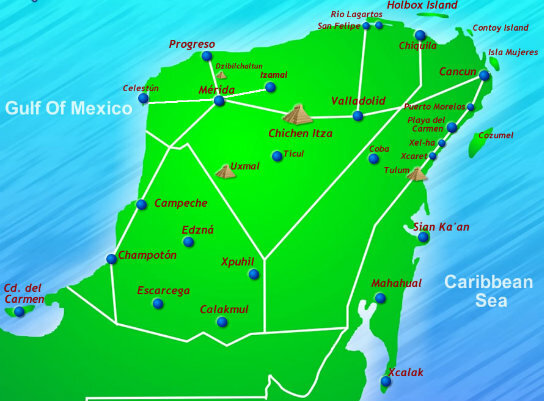 PEOPLE: The population of the Yucatan is a combination of Maya and Spanish/Indian mestizos. VISA: No visas are required, but tourist cards are a must. Stays are good up to 180 days. ELECTRICITY: 110 volts. Same as U.S.
TIME ZONES: The Yucatan and Mexico observe Central Standard Time all year. FLIGHT TIMES (HOURS) TO CANCUN: New York (3.5); Miami (1.5); Los Angeles (4.5); Vancouver BC (6); Toronto (4.5); Denver (4); and Europe (12). HEALTH & SAFETY: No shots are required. Most hotels and restaurants offer purified tap water, but drink bottled or seltzer water (agua mineral) to be sure. Qualified English-speaking doctors are available for health emergencies. Crime in the Yucatan is limited to a rare pick-pocketing or overcharging for drinks. Use common sense. LANGUAGE: Spanish, Mayan and English are spoken in major cities. SMOKING: There’s far too much. Cuban cigar smokers will be pleased: they’re legal here. THINGS TO BUY: Silver and gold jewellery, pottery, hammocks, honey, embroidered dresses, Panama hats, men’s guayabera shirts, wood carvings and blankets. DRIVING/CAR RENTAL: Rental cars are expensive, and you should buy all the insurance they offer. Roads are excellent but you should use caution driving at night. Buses are a good alternative and very reasonable. 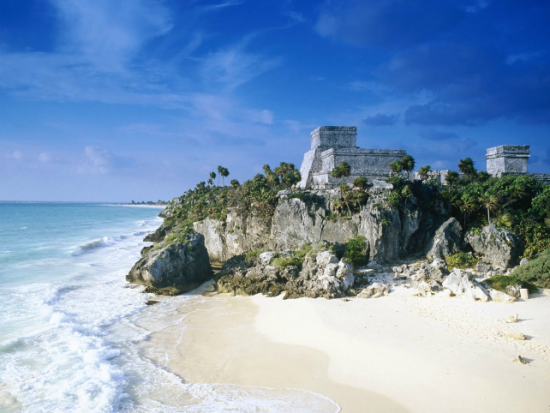 PLACES TO GO: See the Maya ruins at Chichen Itza, Coba, Uxmal, Tulum and many other places. Check out the colonial cities of Merida, Valladolid, Campeche, Izamal and the abandoned and restored haciendas in the north. 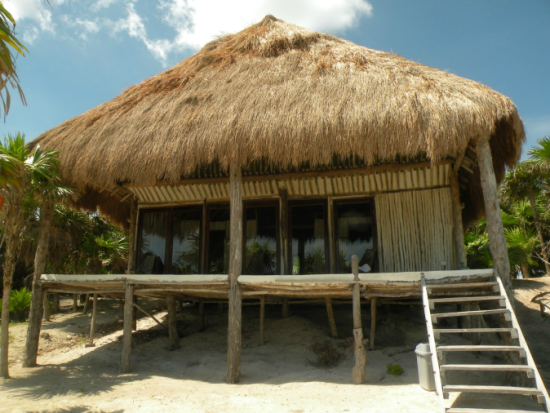 Visit the nature reserves at Celestun, Rio Lagartos and Sian Ka’an. THINGS TO DO & SEE: Swim in cenotes, lie on fabulous beaches, dive, snorkel, windsurf, get tanned, drink margaritas and beer (not necessarily in that order), read a book, explore the ruins, go down into caves, hike, bike, camp and just generally have a wonderful, exciting vacation in Mexico.